As we kick off 2019, I want to let you in on some big, totally awesome new stuff we have coming your way in February. I would be remiss to pass up the opportunity to use the Golden Globe win of the great flick Spider-Man: Into the Spider-Verse to create our web (see what I did there?) of origin stories and why we are making the biggest evolution in our company history. When I joined Inavero and our CEO Eric Gregg over a decade ago, we were on a mission to build a technology solution that transforms how people are treated by the companies they work for and do business with by increasing service transparency. Over the past 10 years, we have spent quite literally millions of dollars doing just that. We have built a technology solution that allows you to gather feedback and turn that feedback into a service-excellence megaphone for your team. We believe, and always will, that exceptional companies deserve a platform that showcases how awesome they are. As Uncle Ben reminds Spider-Man ‘with great power comes great responsibility’… and our clients have empowered us to be the voice for their industries. You have entrusted us to bring transparency to your most trusted relationships with clients (and, in staffing, your talent and employees). We carry that responsibility with pride and are more confident today than ever before that we must not waver from our commitment to bring transparency to the experience that clients have with the companies they work with and for. 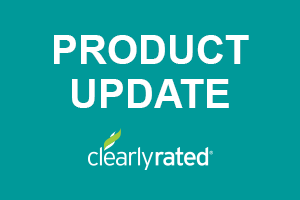 As previously announced, we are dropping Inavero and officially becoming ClearlyRated next month. This gives us a single, powerful platform through the ClearlyRated brand and the clearlyrated.com directory to connect prospects and buyers with exceptional companies like yours, which is very very exciting! This cutover will happen on February 7th. Which means the public announcement of our 2019 “Best of” award winners will be showcased on clearlyrated.com. So what does this change really mean? Like it or not… believe it or not… the research doesn’t lie and it is telling us that everyday more of your prospects are using online star ratings to make decisions about the companies they choose to work with and for. All of us youngsters that grew up with eBay seller ratings and Amazon product star ratings are now in the buyer’s seat. We depend on online ratings for every purchase we make. In service of our mission, we will NOT let our clients fall behind that buyer behavior trend. With the introduction of the clearlyrated.com directory, we put you in front of more prospects as they use search engines like Google to evaluate potential service providers. Significantly more search engine optimized and targeted pages across clearlyrated.com. Buyers are often buying all sorts of services, so a multi-industry directory cross-sells leading to more exposure than a single-industry directory. Award winners are prominently promoted across more search optimized pages. For multi-location firms, you can now enable location-specific star ratings! Google loves them. Location ratings are more important now than ever. Google requires that all star ratings that are encoded to display in their search results for a specific office location must accurately represent the people that interacted with that physical location. A lesson we learned the hard way is that you must conform to what Google requires if you want to get the best placement in search results; which we want for you and you want for you. For those of you with more than a single office location, you were probably asked to provide location information for all survey contacts. This allows you to map your survey responses to the locations they represent, complying with Google’s requirement. If you are unable to do this, we have provided an option to turn off location ratings so we are still in compliance with Google. There is great benefit to having encoded location ratings so we strongly suggest utilizing this feature. I wish you a very awesome start to 2019! Nathan Goff manages the product strategy and development as CTO at ClearlyRated, where he gets to channel his passion for growing technology companies through continuous improvement and a focus on client and employee satisfaction.